As we get into our Fall Season, the temperatures cool and the fishing heats up. We are having to work to find the fish, but when we do it is a great time. While we can’t guarantee the fish will bite on every trip, we can guarantee you will get a top notch captain, mate, boat and gear to give you the best opportunity at catching a trophy fish. We still have some dates left in October and we are booking up November-December, so please give us a call. Captain Hale at the helm and first mate Mat on the back deck for a ½ day local trip this afternoon. 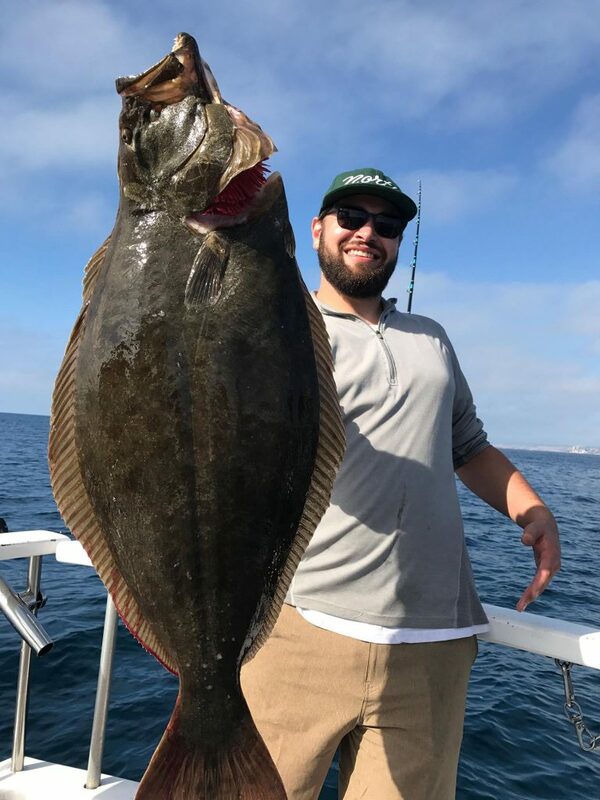 It was a slow pick at bottom fishing and dealing with the dogs (seals), but in the final inning one of the anglers hooks a doormat (halibut) to make the day! They caught 2 lingcod, 3 Boccaccio, 1 copper and 1 halibut. 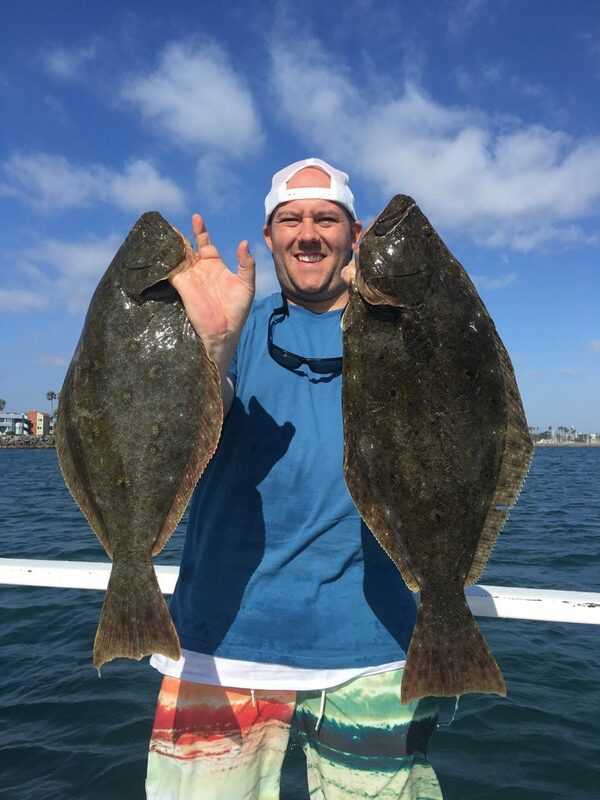 Thanks Andrew for choosing Coletta Sport Fishing for your fishing adventure. It was a pleasure working with you in setting up your trip for your friends. Captain Brian at the helm and first mate Mat on the back deck for a ¾ day local trip today. The lingcod bite well once they decided to bite. They caught 13 lingcod (released 3), 3 copper rockfish, 3 Boccaccio and 1 calico bass for all their hard work. 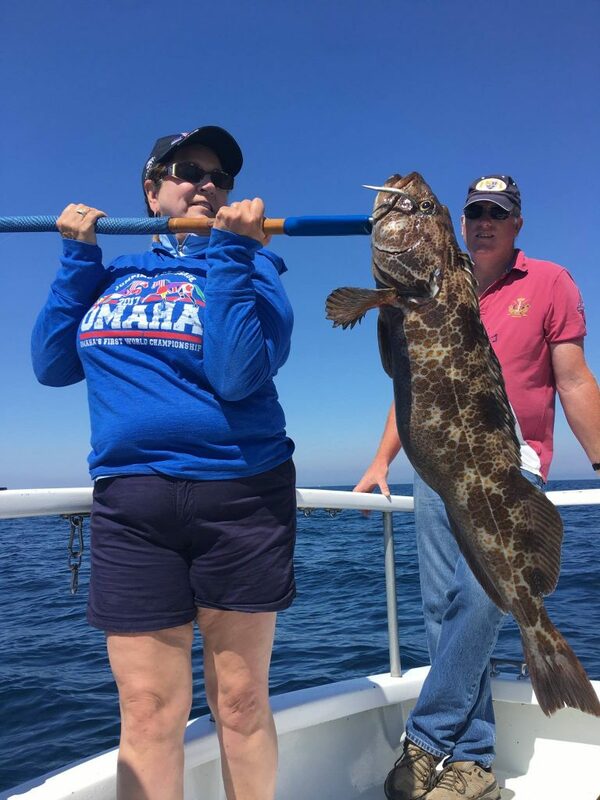 Thanks Sue for choosing Coletta Sport Fishing for your fishing adventure. It was a pleasure working with you in setting up your trip for your family. Captain Jon at the helm and first mate Hale on the back deck for a 1/2 day local trip this morning. 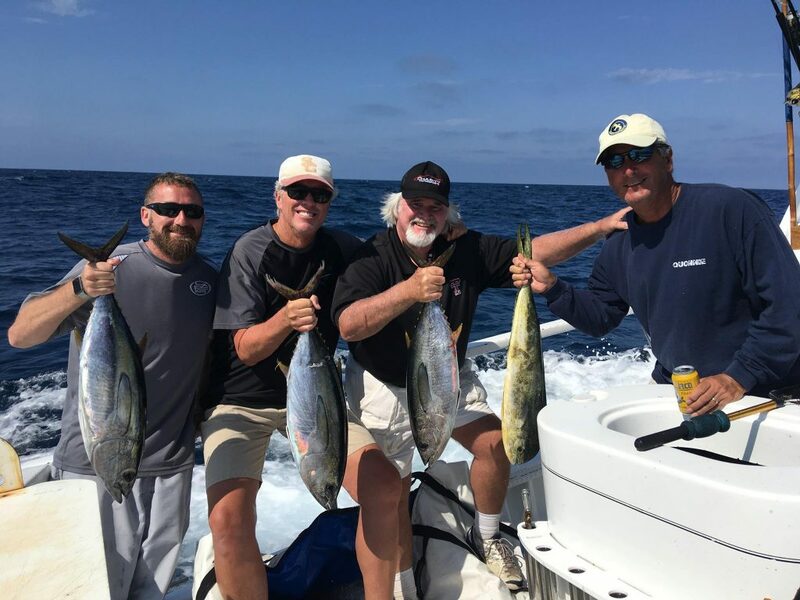 They started out slow trolling for some yellow tail and picked up a bonito. They decided to change it over and target some bottom critters and picked up 8 lingcod (6 safely released) and 1 bonito (Safely Released). Thanks Alex for choosing Coletta Sport Fishing for your fishing adventure. The pleasure was all ours. Captain Brian at the helm and first mate Mat on the back deck for a ¾ day local trip today. It was a productive multi species trip today. They caught 2 halibut, 8 calico bass (3 released), 21 bonito (10 released), 1 sand bass and 1 whitesea bass released. Great job you guys on catching all those fish. Thanks Casey for choosing Coletta Sport Fishing for your fishing adventure. The pleasure was all ours. Captain Jon at the helm and first mate Carl on the back deck for another offshore trip today. They worked the same area they fished yesterday and had 2 blind jig strikes (1 yellow fin & 1 dorado). 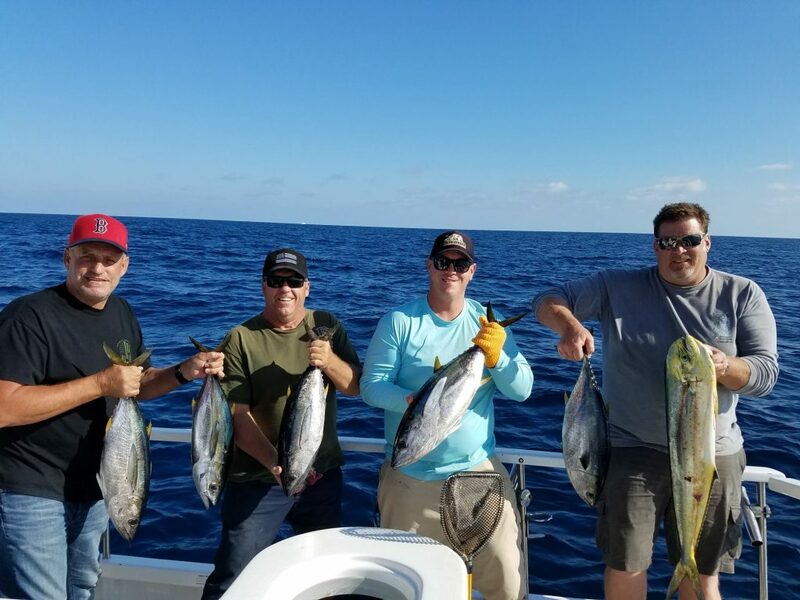 They moved to another zone and soaked some bait and picked up another 6 yellow fin Tuna! Great job guys on those fish. Thanks Rob for choosing Coletta Sport Fishing for your fishing adventure. Captain Brian at the helm and first mate Mat on the back deck for a full day offshore trip today. 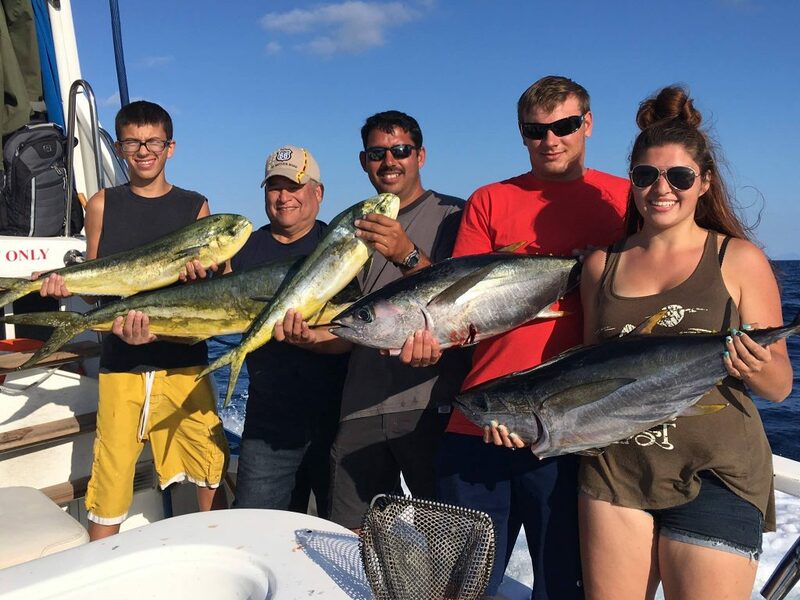 The fishing was on the tough side but the group still caught 3 dorado and 2 yellow fin tuna. They also lost 3 nice fish on the trolling gear. 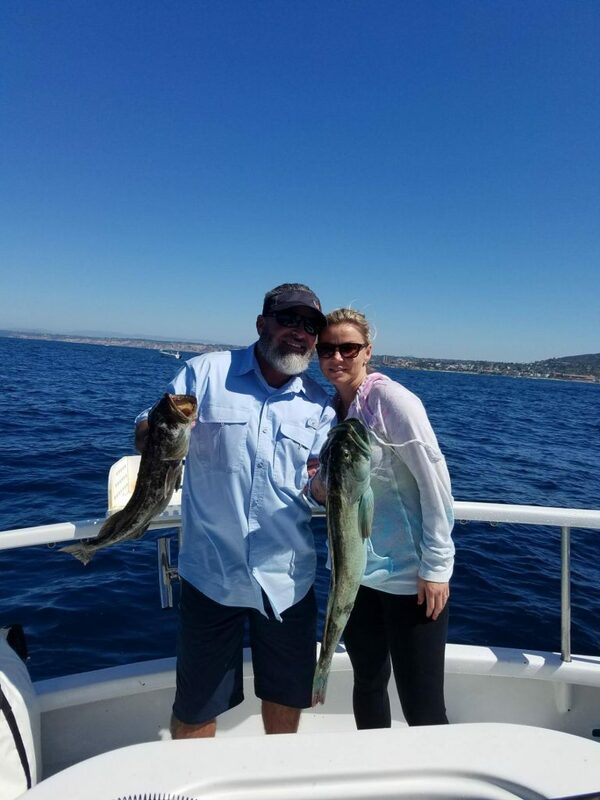 Thanks George and Karen for choosing Coletta sport fishing for your fishing adventure. Enjoy San Diego and get back home safe! Captain Brian at the helm and first mate Mat on the back deck for another fun offshore trip. It was a decent ¾ day of fishing with plenty of kelps and a few troll stops. Nothing wide open but a couple of fish here and there did the trick for the anglers. They caught 6 yellow fin tuna, 6 dorado, 1 bullet tuna, 1 yellowtail and a mako shark (released). Thanks Gregg for choosing Coletta Sport Fishing for your fishing adventure. The pleasure is all ours! That’s the report for now.